Back south across the high plateau from Twizel and back through the Lindis Pass, but instead of turning right (west) for Wanaka, it was straight on (south) through Cromwell to Queenstown. 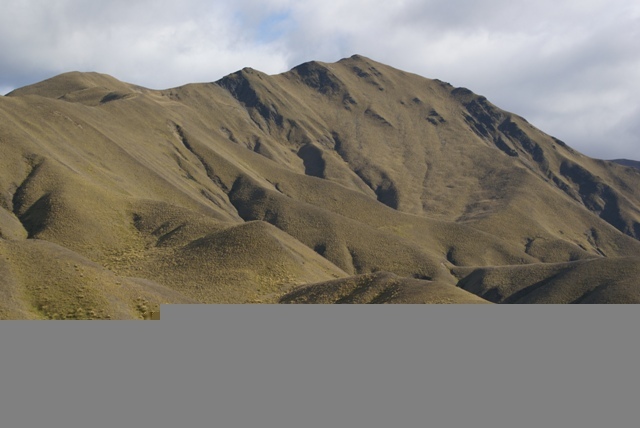 The road followed mountain passes and gorges and was another spectacular drive through tussock covered or bare rock mountains. This area is inland and sheltered from the rains that fall to the west, so very little vegetation grows here. 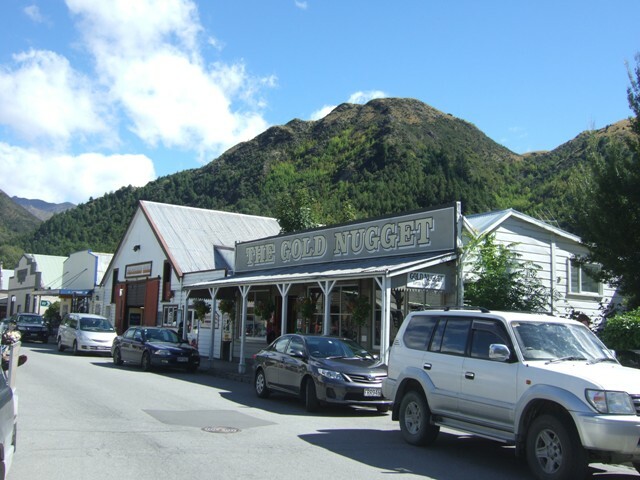 It was another sunny day and before reaching Queenstown we stopped at Arrowtown, a preserved and very picturesque old gold mining town. A spot on the river here was one of the locations in Lord of the Rings so had to be checked out. 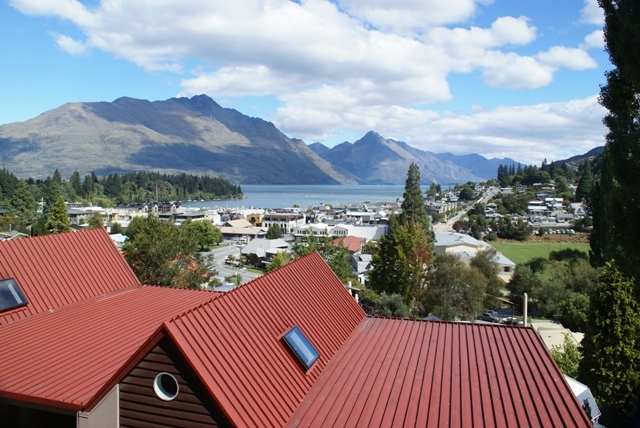 After a leisurely wander round the town (it's that sleepy sort of place) it was on to Queenstown for a 1 night stop. 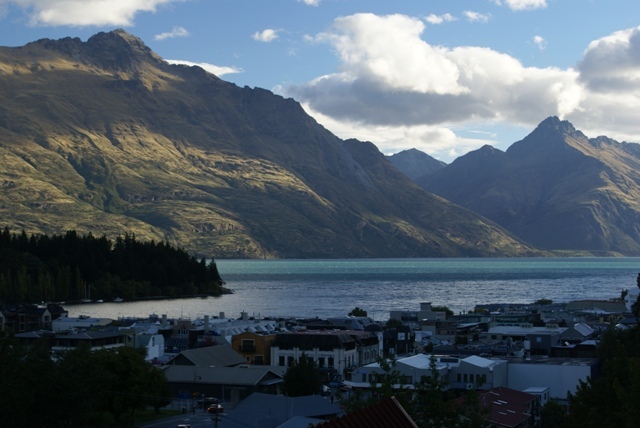 Queenstown is the adventure capital of NZ and all the things you read about can be found - bungy jumping, jet-boat riding, white-water rafting, mountain climbing and trekking, skiing (in winter) - it's all here. As a result we were not sure what we would find and whether we would like the town. As it turned out, it is a lovely town, well laid out with a good array of shops, and with fantastic views. The town is on the shores at the head of Lake Wakatipu (perhaps only 3 miles wide, but 30-40 miles long) and surrounded on all other sides by high mountains. As a result the town has expanded up the sides of the mountains and our motel, actually a 3 storey town house, was high up on the hillside with superb views across the town, lake and surrounding mountains. The road up to it was so steep you felt you had to walk carefully to avoiding falling down it. It must be horrendous in winter with ice and snow on the road. Being in the adventure capital of NZ we had to do something. Bungy jumping was definitely out, so we had a go at jet-boating. 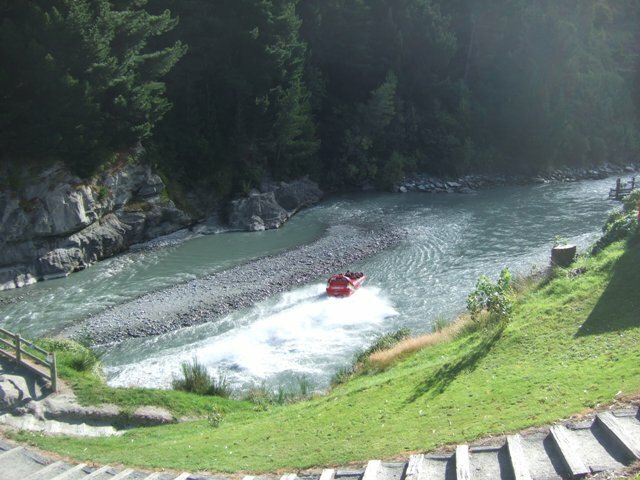 The Shotover Jet - 'The World's Most Exciting Jet Boat Ride' according to brochure and it didn't disappoint! It tore through narrow canyons and gorges in sometimes very shallow water at breakneck speeds of over 50 mph. The ride was breathtaking and the scenery stunning. We all survived! 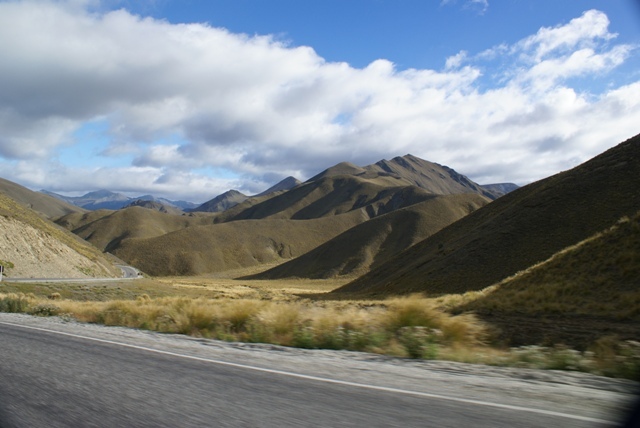 Scenery going back through Lindis Pass. The road is high up and winds through the mountains. 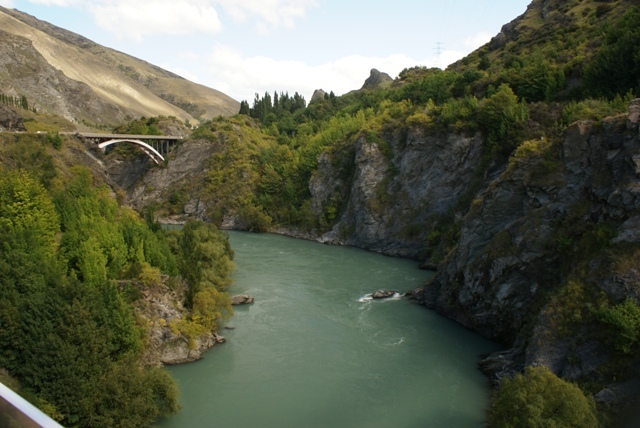 The old Kawarau suspension bridge across one of the many gorges. 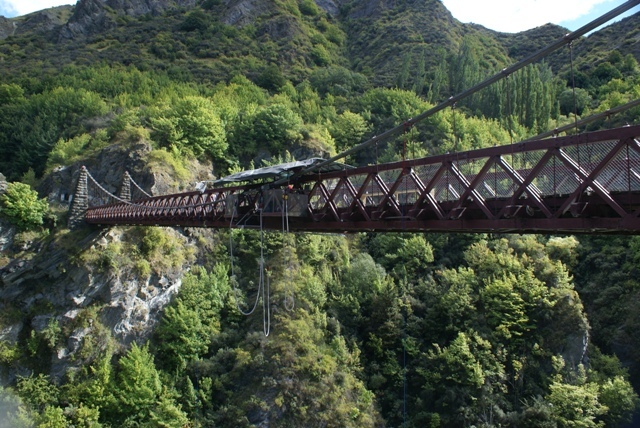 It's now used for bungy jumping! The view from the suspension bridge looking down the gorge at the new bridge that's replaced it. 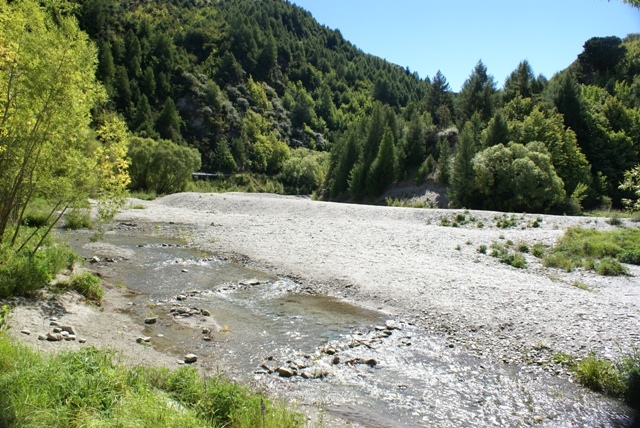 The river at Arrowtown - very picturesque and one of the locations in Lord of the Rings. 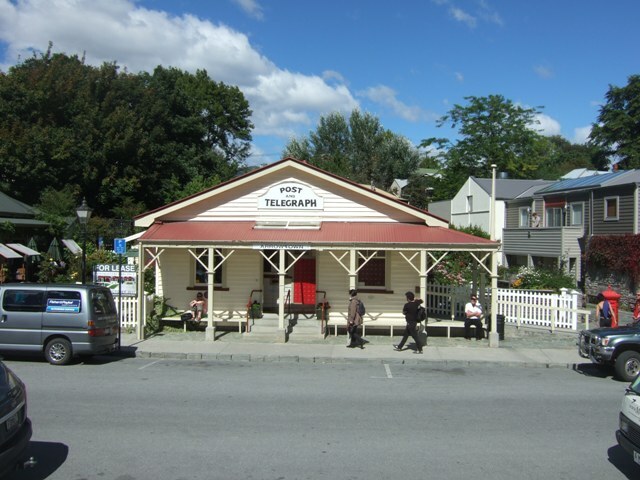 The old Post and Telegraph building in Arrowtown. 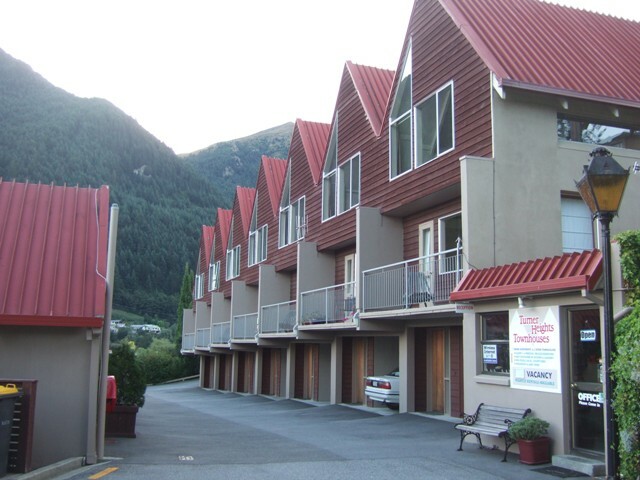 Our motel in Queenstown, a townhouse. Every motel we've stayed in has been different. 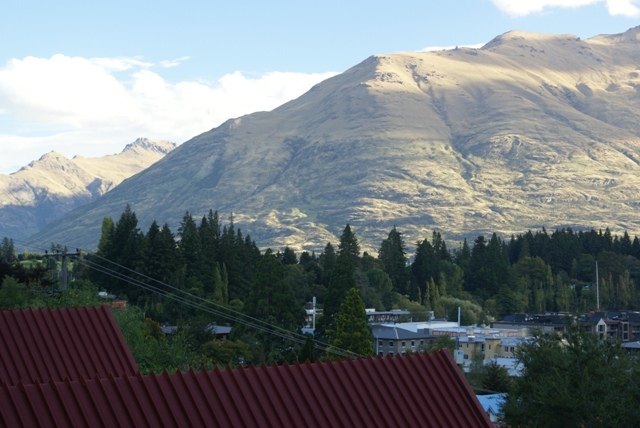 This and the 2 below are views across Queenstown from our motel room. camera high on the bow and stern, so we have a video of our ride (should we ever forget it! ).